This report follows on from the previous report on the Senate’s activities and outlines the Senates activities from 1st January 2004 until the end of the Senate’s 4th term of office (15th December 2004, i.e. the commencement of the 1st sitting of the Senate in its 5th term of office after the regular elections to the Senate in November 2004). Changes were made to the composition of the Senate in 2004 following the elections to the European Parliament, which were held on 11th, and 12th June 2004. The following senators stood in these elections: Richard Falbr (ČSSD), Daniel Kroupa (KOD), František Mezihorák (ČSSD), Helena Rögnerová (Independent), Zuzana Roithová (KDU-ČSL), Luděk Sefzig (ODS), Josef Zieleniec (unaffiliated senator) and Vladimír Železný (Unaffiliated). Richard Falbr, Zuzana Roithová, Josef Zieleniec and Vladimír Železný were elected as members of the European Parliament and their mandate as senators ended on 20th July 2004 when the 1st session of the European Parliament was held. By-elections were held in the constituencies of the last two senators mentioned on 8th and 9th October 2004 (2nd round on 15th and 16th October). In constituency no. 20 – Prague 4 - František Příhoda (ODS) was elected senator and in constituency no. 54 – Znojmo - Milan Špaček (KDU-ČSL) was elected. Because the terms of office of senator Richard Falbr and senator Zuzana Roithová would have ended in 2004, by-elections were not held in accordance with the election law and their places were occupied in the regular elections held in November 2004. The “Unaffiliated” Senate Caucus set up in November 2003 ended with the departure of senator Vladimír Železný to the European Parliament (the number of members dropped below the required number of 5). Senator Robert Kolář terminated his membership of the Caucus of Open Democracy (KOD) on 18th October 2004, became an unaffiliated senator and later a member of the ODS senate caucus. In the second year of the 4th term of office the Senate bodies worked in the same way as in the previous year (more about the Senate bodies here). On the day the Czech Republic joined the European Union the Committee on European Integration changed its name to the Committee on European Union Affairs. Here you can find a complete summary of the Senate’s legislative activities in 2004. During the period under observation there were 6 sittings of the Senate which took up 23 days. In total senators gave their approval for the ratification of 43 international treaties and discussed 152 bills, of which 2 were constitutional bills which the Senate approved (changes to the borders with Austria and Germany). Of the remaining 150 bills passed to the Senate it approved 73 bills. During the negotiation of 23 bills the Senate expressed its wish not to handle them. 42 bills were returned to the Chamber of Deputies with proposed amendments. In 28 cases the Chamber of Deputies agreed with the Senate’s wording, a further 12 bills were accepted in the Chamber of Deputies’ original wording, 2 bills did not receive a sufficient majority in any wording and were not passed. In the period in question 7 bills were rejected by the Senate. In 5 cases the Chamber of Deputies insisted on its original wording, in 2 cases the bill did not receive the necessary majority and was not passed. In 5 cases the Senate did not pass any resolution and after the legal period had expired the bills were therefore passed. Therefore, in total in 2004 up until the end of the 4th term of office the Senate discussed 152 bills, of which it approved 75, with 23 of them it expressed its wish to not handle the bill, 42 bills were returned to the Chamber of Deputies with proposed amendments, 7 bills were rejected and in 5 cases it did not pass a resolution. Of the 42 bills which the Senate returned to the Chamber of Deputies with proposed amendments 28 were approved in the Senate’s wording, i.e. 66 %, in 12 cases the Chamber of Deputies insisted on its original wording, i.e. 29 %, and 2 bills were not passed, i.e. 5 %. In total in the 4th term of office senators gave their approval for the ratification of 81 international treaties and discussed 260 bills, of which 3 were constitutional bills. The Senate approved 125 bills, including 2 constitutional bills. During the negotiation of 47 bills the Senate expressed its wish not to handle them. In 11 cases the Senate did not pass any resolution and after the legal period had expired the bills were therefore passed. 67 bills, including a constitutional bill, were returned to the Chamber of Deputies with proposed amendments. In 43 cases the Chamber of Deputies agreed with the Senate’s wording, a further 21 bills were passed in the Chamber of Deputies’ original wording and 3 bills were not passed (including the constitutional bill). The Senate rejected 10 bills. In 7 cases the Chamber of Deputies insisted on its original wording, in 3 cases the bill did not receive the necessary majority of votes and was not passed. an amendment to the Radio and Television Broadcasting Act – the main focus of the proposed amendment was the alteration of certain provisions of the Radio and Television Broadcasting Act with the aim of ensuring that they were fully compatible with European Community law /Senate Document no. 322/ - in a repeated vote the Chamber of Deputies approved the bill in the wording approved by the Senate. an amendment to the Building Act – the aim of the bill was to remove certain difficulties which exist in practice during the acquisition and approval of territorial planning documentation for the regions. The regions will have the opportunity to acquire and approve plans for large territorial units and the government’s authority to approve these plans if they include areas in more than one region was removed /Senate Document no. 335/ - in a repeated vote the Chamber of Deputies approved the bill in the wording approved by the Senate. an amendment to the Family Act, an amendment to the Civil Procedure Code and an amendment to the State Social Support Act – the proposers’ aim was to shorten the adoption process and make it more efficient /Senate Document no. 371/ - neither version received sufficient support in the Chamber of Deputies and the bill was not passed. the Schools Act; an amendment to related regulations; a bill on pedagogical workers – the purpose of the proposed bill is to replace and regularise the existing fragmented and inadequate legal regulation on regional education; to create a new legal norm which will comprehensively resolve the problem of education from pre-school to basic and secondary education to higher education. The proposed legal norm also includes other types of education, for example, special-interest, basic artistic and linguistic education. New levels of education are defined in secondary education. There is also new regulation on school-leaving examinations, they are expected to be introduced in the 2007 – 2008 school year /Senate Document no. 403, Senate Document no. 404 and Senate Document no. 405/ – the Chamber of Deputies accepted the Senate wording in all three cases. an amendment to the Energy Act – as the report on the bill states it was submitted primarily because of newly adopted guidelines on the rules for the functioning of the electricity and gas markets. The bill also reacts to certain application inaccuracies which arose from previous practice in applying the law /Senate Document no. 435/ - in a repeated vote the Chamber of Deputies approved the bill in the wording approved by the Senate. a bill on noise assessment in the environment – this Act transposes into Czech law the European Parliament and Council directive 2002/49/ES on the assessment and control of noise in the outdoor environment and represents an entirely new legal regulation in an area previously unresolved by legislation: long-term strategic planning in the protection of the environment against noise. As part of the legislative process in the Chamber of Deputies an unrelated amendment to the Act on Budgetary Rules for Territorial Budgets was attached to the original government bill on the basis of a proposed amendment by Deputy Krákora /Senate Document no. 445/ - the Chamber of Deputies first of all approved the bill in its original wording; after it was returned to it by the President of the Republic the bill did not receive the required number of deputies to defeat the veto. an act on the amendment of certain acts relating to the reform of public finances in remunerations – the submitted bill cancels the institute of other payments or remunerations for members of municipal and regional councils. The institute of other payments was brought into law in 1994 for employees in the budgetary sector remunerated according to Act 143/1992 Coll., on payment and remuneration for emergency work in budgetary and certain other organisations and bodies. The reason for this alteration was the fact that salaries in the budgetary sector had fallen significantly behind the level of wages in the business sector /Senate Document no. 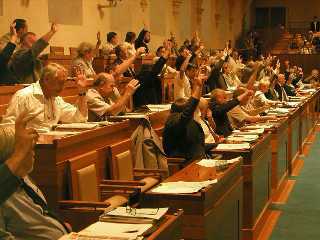 426/ - in a repeated vote the Chamber of Deputies accepted the Senate wording. an amendment to the Office for State Representation in Property Matters Act and the Civil Procedure Code and the Constitutional Court Act – the government submitted the bill as a reaction to the disputes on property rights between municipalities and parties claiming ownership rights to immovable assets which originally became the property of the state and then on the basis of laws and contracts the municipalities acquired ownership of them. The purpose of this amendment was for the state to provide the municipalities with help in conducting such disputes. 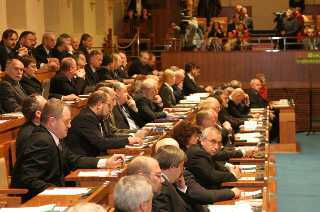 The municipalities, as participants in proceedings, will be represented by this Office, they will be given legal aid free of charge – the Senate rejected the bill due to doubts over whether the amendment was in accordance with the constitutional order of the Czech Republic /Senate Document no. 252/ – the Chamber of Deputies insisted on its original wording. a bill on the Outstanding Services of Edvard Beneš Act /Senate Document no. 285/ – the Chamber of Deputies approved the bill in its original wording; the President of the Republic did not veto the bill, nevertheless he did not attach his signature to it. an amendment to the Civil Code – the amendment concerns the regulation of the end of lease relations to land. The Senate believed there were two problematical exceptions to the extended notice period for contracts concluded for an indefinite period, namely when land is removed from the agricultural land fund and the favouring of a lessor involved in agricultural production, especially the formulation of the previous provisions. The question of a possible restriction to the land owner’s rights and indirect intervention in the land market were also discussed in depth. It was also stated that the final wording of the bill after alterations had been made during discussion in the Chamber of Deputies significantly weakened the government’s original purpose with regards to the stabilisation of lease relations to land /Senate Document no. 394/ – the Chamber of Deputies did not approve the bill in its original wording and so it was not passed. an amendment to the Civil Procedure Code. 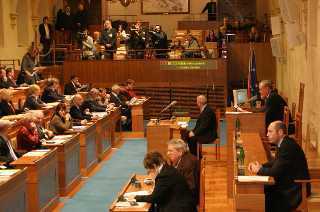 the Administrative Procedural Code, the Court Fees Act and the Advocacy Act – the amendment concerns judicial service, the discontinuation of proceedings in cases where the court asks the Court of Justice in Luxembourg to decide on the matter in question and the Advocacy Act regarding the setting up of a branch of the Bar Association in Brno – the Senate considered the amendment to be very casuistic. It believed that the alterations would not guarantee an improvement in the situation and would require further amendments. Also the Act should not interfere with the internal organisation of the Czech Bar Association and not decide where other branches are to be established /Senate Document no. 402/ – the Chamber of Deputies insisted on the original wording. an amendment to the Sale and Export of Objects of Cultural Value Act /Senate Document no. 247/ – the amendment reacts in particular to the previous absence of legal regulation on the export of objects of cultural value for a fixed period (for example, the loan of various artistic artefacts to foreign exhibitions) and already makes allowances for the possibility of such export of cultural inheritance in the future. an amendment to the Registers, Names and Surnames Act /Senate Document no. 286/ – the most important amendment is the incorporation of a woman’s right to have her surname entered in the registry book, and subsequently also used, in the masculine form. Other proposed amendments to the Registers Act concern the organisation of registry offices’ activities or clarify individual provisions of the law on the basis of previous experience in applying it. an amendment to the Trade Act /Senate Document no. 292/ – the main purpose of the amendment is to achieve a connection between this norm and the law on the recognition of specialist qualifications. Certain European Community directives affecting documents proving general performance and special conditions for carrying out a trade are directly transposed here. After this amendment to the Trade Act has been passed the Czech trade law should be in harmony with European Community legislation and the conditions for entry into business according to the Trade Act should be the same for both Czech citizens and citizens from EU member states. the Employment Act /Senate Document no. 342/ – among the main principles of the proposed legal regulation are a clarification of procedures and the tightening of conditions during the mediation of employment by labour offices, in particular the conditions for inclusion in job applicant records, in order to increase the motivation of job applicants to co-operate with the labour office in the process of obtaining employment and the tightening of conditions for entitlement to support when unemployed, an amendment to the amount of unemployment support and the length of time it is provided. the Defence Act /Senate Document no. 419/ – a decisive change compared to the existing regulation in that compulsory military service (recruitment and professional) will only occur if Parliament announces, on the government’s proposal, that the country is in danger. In “peace” time the armed forces can therefore only be supplemented through the voluntary (contractual) acceptance of a commitment to serve, in particular in the professional army. the Termination of Civilian Service Act /Senate Document no. 421/ – the submitted bill relates to amendments to the concept of compulsory military service which are to occur with the establishment of a professional Czech army. The proposed new Compulsory Military Service Act (Defence Act) no longer contains provisions on basic (substitute) military service. This means that it is terminated and military training will only be voluntary. Basic military service ended on 22nd December 2004.
an amendment to the Income Tax Act /Senate Document no. 449/ – the amendment introduces entirely new institutes, namely joint taxation of spouses and tax advantages. Spouses who maintain at least one child living with them in a household will be able to make use of joint taxation of spouses if they meet these conditions at least on the last day of the tax period. Practical use of this provision comes into consideration for spouses who record different tax bases because one of the spouses does not have any income or part of his/her base is taxed at a higher percentage rate than the other spouse’s income is taxed. an amendment to the Penal Code /Senate Document no. 452/ – the amendment expands the list of incriminating circumstances which the courts can take into consideration when setting terms of punishment. A new incriminating circumstance may be the committing of a crime against a person protecting health, life or property. the Compulsory Labelling of Alcohol Act /Senate Document no. 448/ – this is an entirely new legal regulation, the aim of which is to prevent tax evasion, to improve the administration of consumer tax on alcohol, to improve consumer protection by ensuring the sale of quality alcohol and, last but not least, to establish equal competitive conditions on the market. In drawing up the regulation experiences from the similar regulation on the labelling of tobacco products was used to a considerable degree. The new law regulates the conditions for the handling of alcohol, including labelling it with control strips, state administration and control over its adherence. In 2004 six Senate initiatives were submitted to the President of the Senate. Also negotiations continued over the Senate amendment to the procedural rules /Senate Document no. 76/, the Senate amendment to the Constitution of the Czech Republic /Senate Document no. 232/ and the amendment of related regulations /Senate Document no. 233/. Following the amendment to the Senate’s procedural rules Senate bills are now discussed at sittings of the Senate in two readings. In the first reading the spokesman appointed by the Organisational Committee outlines the purposes of the bill and proposes which committee or committees should discuss it. The Senate may also return a bill to the proposer for more work to be done on it or it may reject it. After the bill has been discussed in the committee or committees (usually 60 days, the period may be shortened to 30 days) a debate is held in the Senate in the second reading, in which it may be suggested that the bill should be returned to the committees for further discussion, or that it should be approved or rejected or that proposed amendments should be added. (information about the state of negotiation reflects the state as of 1st February 2005, information about the further course of the legislative process can be found under the link to the relevant Senate Document). In 2004 the Senate completed discussion of the Senate bill which amends the Senate Procedural Rules Act 107/1999 Coll., in the wording of Act 78/2002 Coll. /Senate Document no. 76/, which was submitted in March 2003 by the Senate Standing Committee on the Constitution of the Czech Republic and Parliamentary Procedure. The bill called for the amendment of the procedural rules in basically four areas: 1. the status of senators and senate caucuses, 2. the taking into consideration of previous experience in the application of procedural and organisational provisions of the procedural rules, 3. a new means of negotiating international treaties, and finally 4. the implementation of article 10b of the Constitution which regulates the principles of cooperation between Parliament and the government in matters relating to the Czech Republic’s membership of the European Union. In June 2003 the bill was approved by the Senate and at the beginning of July it was submitted to the Chamber of Deputies /Chamber of Deputies Document no. 387/. It was approved by the Chamber of Deputies in its third reading in February 2004 in its 27th sitting with proposed amendments and in March it was passed over to the Senate /Senate Document no. 310/. The Senate approved the bill at its 14th sitting on 26th March 2004. The Law was declared in the Collection of Laws under number 172/2004 Coll. 2004 also saw the continuation of discussions over the Senate constitutional bill which amends the Constitutional Act 1/1993 Coll., the Constitution of the Czech Republic, as amended /Senate Document no. 232/ submitted by senators Jan Hadrava, Petr Fejfar, Helena Rögnerová, Václava Domšová, Josef Zoser, Jiří Zlatuška, Soňa Paukrtová, Martin Mejstřík and Zdeněk Bárta in December 2003. The bill calls for the deletion of the complete previous paragraph of the constitutional clause on the removal of deputies and senators from the authority of public offices for crimes, including the relevant legal provisions. It proposes that refusal to approve criminal prosecution be only restricted to the term of the deputy or senator’s mandate. The amendment of immunity from lifelong to time-restricted (term of mandate) should not affect previously acquired rights to not be prosecuted. The bill was discussed by the committees, then the Senate at its 14th sitting adjourned discussion of this bill until 30th June 2004. The bill was then included on the programme of the Senate’s 17th sitting and adjourned until 31st August 2004. The bill was last discussed during the Senate’s 3rd sitting in its 5th term of office and the Senate rejected it in its resolution no. 61 on 28th January 2005. Together with the amendment to the Constitution these same senators submitted a Senate bill which amends certain Acts regarding the adoption of Constitutional Act no. ?.., which amends the Constitutional Act 1/1993 Coll., the Constitution of the Czech Republic, as amended /Senate Document no. 233/. As part of the adoption of the Constitutional Act which amends the transgressional liability of deputies and senators, it is necessary to also include these amendments at a sub-constitutional level, i.e. in the law on the transgressional and procedural rules of the Chamber of Deputies and the Senate. The bill was discussed with Senate Document no. 232 and following its rejection the bill was taken back by the senators who had submitted it at the Senate’s 3rd sitting in its 5th term of office. Senate Document no. 262 – a bill by senator Jitka Seitlová and others, which amends Act 18/1997 Coll., on the peaceful use of nuclear energy and ionizing radiation (the Atomic Act), as amended, was submitted to the Senate on 6th January 2004. The submitted amendment to the Atomic Act expands the group of participants in selected administrative proceedings carried out according to the Atomic Act with regards to an affected municipality and other parties which a separate law generally acknowledges this status. Additionally, the bill gives municipalities a right of “veto” in proceedings to permit the location of a nuclear facility or a radioactive waste disposal site. The Senate included a document in its 14th sitting and discussed it on 18th March 2004. The result of the discussion was an adjournment of one year. In January 2004 senator Jitka Seitlová and others submitted a Senate bill which amends Act 193/1999 Coll., on the State Citizenship of Certain Former Czechoslovak State Citizens, in the wording of Act 320/2002 Coll. /Senate Document no. 270/. This amendment proposed expanding the group of persons entitled to declare re-acquisition of our state citizenship. Specifically the decisive period for including a person in the law, i.e. 25.2.1948 until 23.3.1990, in which the person lost our citizenship, is extended to 21st August 1997. Likewise it states that an entitled person can not be a person who lost our citizenship because they went abroad after 1st January 1990. The Senate discussed the bill at its 14th sitting on 18th March 2004 and approved it in its resolution no. 462. At the end of March it passed it over to the Chamber of Deputies /Chamber of Deputies Document no. 612/ which in turn rejected it in its first reading at its 31st sitting on 5th May 2004. Senate Document no. 323 – in March 2004 senator Václav Roubíček and others submitted a Senate bill which amends Act 111/1998 Coll., on Universities and the Amendment and Supplement of Other Acts (the Universities Act), as amended, the Income Tax Act 586/1992 Coll., as amended, and the State Social Support Act 117/1995 Coll., as amended /Senate Document no. 323/. The key points of the amendment to the Universities Act are the introduction of the option to charge school fees at public universities, an amendment to the rules on the election of members of academic senates at public universities and faculties and a new regulation on the management of universities. The Senate approved this bill at its 16th sitting in June 2004, at its 14th sitting on 18th March 2004 and in its resolution no. 462 and at the end of June it passed it over to the Chamber of Deputies /Chamber of Deputies Document no. 715/. The Chamber of Deputies rejected it in its 1st reading at its 41st sitting. Senate Document no. 364 – In May 2004 the Committee on National Economy, Agriculture and Transport (represented by senator Jan Fencl) submitted a Senate bill which amends the Consumer Tax Act 353/2003 Coll., as amended. The amendment proposes ensuring that primary production farmers when proving their entitlement to a return of consumer tax according to § 57 of the Consumer Tax Act do not have to prove on the basis of what legal title they are using individual pieces of land for primary agricultural production. It proposes that farmers (including those who have already proved that they are primary producers according to the previous legal regulation) prove their entitlements by submitting a document from the records on the use of agricultural land according to § 3a – 3l of Act 252/1997 Coll. These records were introduced with effect from 4th June 2004 by Act 128/2003 Coll. At its 16th sitting in June 2004 the Senate assigned the bill in its resolution no. 454 to the committee and also shortened the period for discussion. At its 17th sitting on 22nd July the Senate then approved the Senate bill in its resolution no. 486 and at the end of July passed it over to the Chamber of Deputies /Chamber of Deputies Document no. 754/. The bill was approved by the Chamber of Deputies in November 2004 and then at the beginning of December it passed it over to the Senate /Senate Document no. 468/. The law was approved by the Senate at its 18th sitting on 9th December 2004 in its resolution no. 563. The law was declared on 31st December 2004 in the Collection of Laws under number 693/2004 Coll. In July 2004 senator Jaroslav Šula and other senators submitted a Senate bill which amends Act 193/1999 Coll., on the State Citizenship of Certain Former Czechoslovak State Citizens, in the wording of Act 320/2002 Coll. /Senate Document no. 406/. The purpose of the submitted amendment to Act 193/1999 Coll. is legislatively realised through the cancellation of § 5 which after the expiry of the prescribed five-year period (5 years from the date of effect, i.e. 2nd September 2004) will prevent our former citizens from having the right to declare state citizenship of the Czech Republic. Practice with the implementation of this law, however, has shown that in view of the vastness of the area in which former Czechoslovak citizens live, information about the opportunity which the law provides is spreading only gradually. In view of this and also the fact that there is no reason to restrict the time period in which it is possible to re-acquire Czech state citizenship, it is proposed that the aforementioned provision should be omitted from Act 193/1999 Coll. The bill was first of all assigned to the Senate at its 18th sitting in resolution no. 529 and subsequently approved on 10th December 2004 in Senate resolution no. 571. In December 2004 it was submitted to the Chamber of Deputies /Senate Document no. 845/. Senate Document no. 436 – In November 2004 a Senate bill was submitted by senator Jitka Seitlová and other senators which amends Act 247/1995 Coll., on Elections to the Parliament of the Czech Republic and the Amendment and Supplement of Certain Other Acts, in the wording of Act 212/1996 Coll., the Constitutional Court finding published under no. 243/1999 Coll., Act 204/2000 Coll., the Constitutional Court finding published under no. 64/2001 Coll., Act 491/2001 Coll., Act 37/2002 Coll., Act 171/2002 Coll., Act 230/2002 Coll., Act 62/2003 Coll. and Act 418/2004 Coll., and Act 150/2002 Coll., the administrative rules of court, in the wording of Act 192/2003 Coll., Act 22/2004 Coll., Act 237/2004 Coll. and Act 436/2004 Coll. The basis of the proposed amendment to the Elections Act (see article I of the bill) is the introduction of postal voting as an alternative to voting in person in polling stations. This new method of voting is only to be used in elections to the Chamber of Deputies. The bill proposes that citizens with permanent residence in the Czech Republic, in addition to voting papers, will also receive the relevant voting envelopes and a statutory declaration form allowing postal voting and they will be able to decide themselves on the method of voting without prior contact with the election body. The bill was assigned to the Senate at its 18th sitting to 3 committees and the Senate Standing Committee on Compatriots Living Abroad was also asked to give a statement. Now at the Senate’s 3rd sitting in its 5th term of office in January 2005 the discussion of this bill was adjourned until the end of February 2005, in resolution no. 62. On 1st May the Czech Republic joined the European Union. 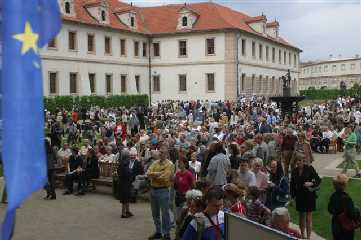 To mark this occasion a meeting was held with citizens in the Valdštejn Garden. On 1st May the amendment to the Senate’s procedural rules came into effect which, amongst other things, regulate the Senate’s cooperation with the government on matters relating to commitments arising from the Czech Republic’s membership of the European Union (§ 119a - § 119h). In connection with the Czech Republic’s entry into the EU the Senate changed the name of the “Committee on European Integration” to the “Committee on European Union Affairs”. Furthermore, on the basis of § 36, paragraph 3, 1st sentence, it designated the Committee on European Union Affairs as the committee authorised to discuss proposed European Union legislative acts, provisional government statements on proposed legislative acts and notification of the government on the state of their negotiation, as well as the discussion of relevant communication documents, and the Committee on Foreign Affairs, Defence and Security as the committee authorised to discuss proposed obligatory measures of European Union bodies regarding Common Foreign and Security Policy, in particular common directions and joint strategies, and regarding Police and Judicial Cooperation in Criminal Matters, government statements on them, notification of the government on the state of their negotiation, as well as the discussion of relevant communication documents. Both committees regularly deal with “European” proposals. First of all, out of all the documents they receive they chose those that they take note of without any discussion. For the others they appoint a spokesman. At their sittings they then discuss the proposals together with the government statements. They may also ask for a statement from the appropriate Senate bodies. 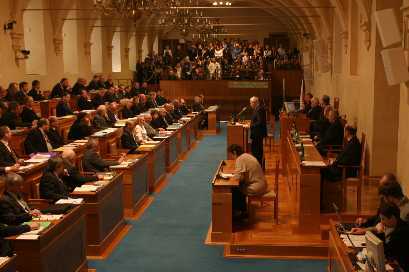 The start of discussions regarding a proposed legislative act prevents a member of the government from taking part in a European Union body’s decision on this proposal. This does not apply if a 35-day period has expired in vain since the delivery of the bill to the Senate. In general, the discussion of these proposals ends with the committees. However, if a committee or a group of at least 17 senators proposes it, the Senate discusses the proposed legislative act and may give a statement on it. The President of the Senate will immediately inform the government of the result of such a discussion. In June 2004 information from the government of the Czech Republic on their ideas leading to the fulfilment of § 119a of the Senate Procedural Rules Act 107/1999 Coll. was submitted to the Senate at its 16th sitting. At its 18th sitting on 10th December 2004 the Senate heard information from the Foreign Minister on the agenda of the European Council meeting to be held on 16th and 17th December 2004 in Brussels and the Czech Republic’s positions and adopted resolution no. 570. In 2004 the Prime Minister continued to regularly inform the Senate about the process and conclusions so far of the European Union Inter-governmental Conference on the Draft Treaty to Found a European Constitution. The Senate dealt with this matter at all 4 of its sittings held from January until June (13th to 16th inclusive) when at a session of the European Council held on 17. – 18.6.2004 an agreement was reached on the final form of the new EU constitutional treaty which should replace the existing founding treaty. In June the Senate instructed the Committee on European Union Affairs and the Senate Standing Committee on the Czech Constitution and Parliamentary Procedure to analyse and discuss the approved Treaty founding the European Constitution and to notify the Senate of its findings. The Committee on European Union Affairs adopted resolution no. 310 in November 2004. The Senate and European Union web site continues to function. Also in 2004 up until the Czech Republic’s entry into the European Union, 17 deputies and 7 senators, on the initiative of the European Parliament, took part as observers in sessions of the European Parliament – parliamentary groups, committees and the plenum. As of 1st May 2004 the observers’ mandate changed because up until 20th July 2004 when the first session of the European Parliament was held after elections, these senators and deputies were regular members of the European Parliament for the Czech Republic. As well as senators, the President of the Republic, members of the government and other persons entitled by law may also participate in sittings of the Senate. 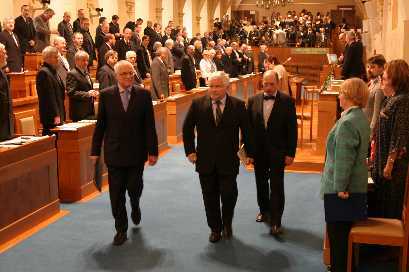 On 18th March 2004 President Václav Klaus took part in a sitting of the Senate for the first time since his election. Here you can find the text of his speech at the 14th sitting of the Senate. According to article 84 of the Czech Constitution, Constitutional Court judges are appointed by the President of the Republic with the approval of the Senate. In 2004 the Senate dealt with 5 requests from the President of the Republic to appoint Constitutional Court judges. In February 2004 President Václav Klaus submitted to the Senate his thirteenth request for approval of the appointment of a Constitutional Court judge. This was for doc. JUDr. Milan Galvas, CSc. /Senate Document no. 280/. His appointment was not approved by the Senate. In April 2004 the Senate received a request for and in May 2004 approved the appointment of JUDr. PhDr. Stanislav Balík as a Constitutional Court judge /Senate Document no. 337/. At its following 16th sitting in June 2004 the Senate discussed the request for the appointment of Doc. JUDr. Michaela Židlická, Dr. contained in Senate Document no. 360. Her appointment was approved by the Senate. In June a request for the appointment of JUDr. Ivana Janů as a Constitutional Court judge was submitted to the Senate by the President /Senate Document no. 376/. The Senate approved her appointment at its 17th sitting in July 2004. The last request discussed in 2004 was the request submitted by the President in October for the appointment of JUDr. Jaroslava Novotná as a Constitutional Court judge /Senate Document no. 434/. Senators voted on this request at its 1st sitting in the 5th term of office on 16th December 2004 and did not give its approval.